When my husband and I visited Trieste together more than a decade ago we didn’t have children. In the meantime, one of my German cousins has chosen to visit this seaport city in Italy with her little ones quite often, and agrees that it has a lot to offer families with kids. Trieste is located in the northeast of the top of Italy’s boot cuff, cradled in the curve of a gulf in the Adriatic Sea, at the foot of a hillside that becomes a mountain. Only a stone’s throw from the border of Slovenia , Trieste has been influenced throughout history by Germanic, Latin, and Slavic cultures (read: very good food!) Like most towns in Italy, it’s a lovely place to stroll through its many narrow alleyways and admire its old, elaborate buildings. In the main square of old Trieste, Piazza Unità d’Italia, you will find Palazzo del Governo, a large Neoclassical palace that houses government offices, and the imposing Palazzo del Municipio, or town hall, as well as other impressive examples of Austro-Hungarian architecture. Glorious Piazza Unità d' Italia, the largest waterfront town square in Europe. 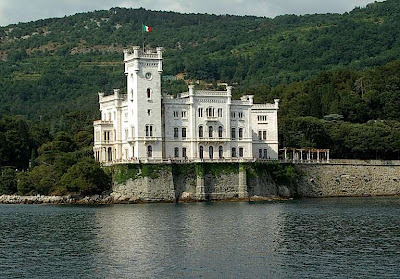 There are two castles in Trieste to delight young children. Miramare Castle on the waterfront has beautiful, serene gardens with ponds, and the peaceful, isolated Castle of San Giusto has spectacular views of the city below. Trieste also has several architectural remains and temples, including a Roman theater built between the first and second centuries AD. For more family fun, visit the Civico Acquario Marino (an aquarium with a delightful penguin exhibit) and L’Ausonia, a spa center with a sea-water swimming pool, as well as a bar, children’s area, lots of open space and a solarium. The beaches in Trieste are very popular with families, but personally, I like sand, and Trieste doesn’t have any. All the beaches are rocks. There’s also an entrance fee at most of the local beaches. Lanterna beach near the city center has a barrier separating the area reserved for women and children from an area reserved for men. (Doesn’t work well for families, does it?) Stabilimento di Miramare beach is a quiet place for families, and there are hot showers and a large changing room, but no convenient parking. A final interesting attraction in Trieste is the Grotta Gigante, a cave that has been open to the public for the last 100 years. In 1995, it was entered in the Guiness Book of World Records as the world’s largest show cave. One of its caverns is spacious enough to hold St. Peter’s Basilica in Rome . Filled with stalactites and stalagmites, the most impressive one is almost 40 feet tall. The cave is open for tours every day in July and August. 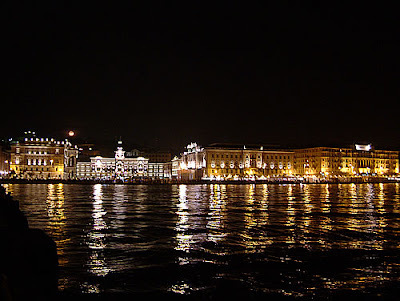 Trieste is a direct two hour train ride from Venice, and worth a day trip or even an overnight for you and your family. Or, if you're spending more time in Trieste, take a drive across the border to Slovenia to see something entirely new! I would love to travel like that! What amazing trips for your kids to see! Dropping in with daily comment love!! Have a tremendous Tuesday! As much as I enjoy traveling with the kids, it's nice to have romantic get aways without them sometimes. And Trieste sounds like a perfect place for a tryst. Great post! Thanks for stopping in on the hop. If you click on a button the linky for all who are participating on that hop will be down some, just scroll down to find it with all participating blogs :).